I’ve talked before about how some of the Legion artifacts just don’t work for my characters, but sometimes the issues go even deeper. With Legion, Blizzard declared that they were pushing the idea of “class fantasy:” your druid should feel like a druid and your mage should feel like a mage, not just interchangeable combinations of game mechanics. In many ways, they’ve done an excellent job of bringing flavor and distinctiveness back into the classes we play. But what if Blizzard’s idea of what your class is all about doesn’t fit with your idea, either about the class as a whole or your individual character themselves? That’s what’s happened with a couple of my characters this expansion: my blood death knight and my demonology warlock. Now, death knights and warlocks have always been “dark” classes. In the game’s story, death knights are the corpses of fallen fighters reanimated by the nefarious Lich King, who then reclaimed their individual will by force. Warlocks are spellcasters who summon demons to do their bidding and dabble in forbidden magic. It’s easy to play both of them as edgy, angst-ridden characters, but before Legion there were other ways you could approach the classes. Though not an active role-player, I generally have some vague sense of backstory and personality for my characters. My death knight chose to stand strong in the face of the darkness and reclaim her past identity as a righteous defender of the innocent. My warlock was a sort of magical naturalist who viewed her demon minions as interesting specimens to be studied and put to good use, but carefully managed and controlled. With Legion, it’s gotten harder to maintain those distinct perspectives under the weight of Blizzard’s “class fantasy” push. For both classes, Blizzard has been ramping up the dark, grim, angsty aspects of these classes, and that comes through in the artifact weapons. 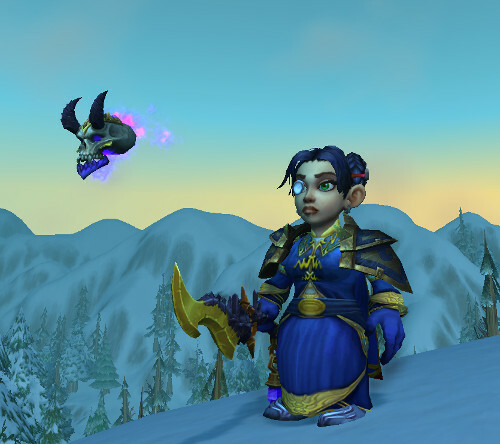 I’ve used my transmog to push back and reassert how I see my characters and how I want to play them. For my death knight, I’ve shunned the dark, spiky, skull-heavy style that Blizzard seems to love and put her in glorious golden armor with touches of blue and purple. 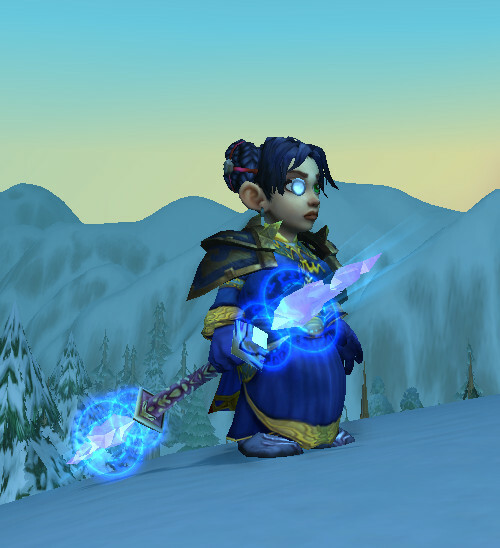 The artifact axe that blood death knights get does not suit the look at all, so I’ve transmogged over the axe with a gleaming silver and blue mace that feels much better for her. So, she has simply not used the artifact this expansion. I know that makes her very underpowered and means she misses out on most of the character advancement in this expansion, but it’s a price I’m willing to pay to make her look the way I want. 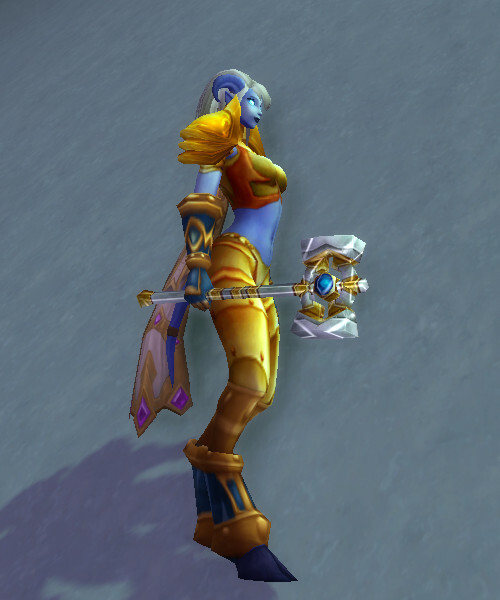 She carries a staff which I have transmogged to one of the most beautiful and extraordinary appearances in my collection. She’s not a character I try to do challenging or group content with, so it’s good enough for me. How are you feeling about Blizzard’s attempt at class fantasy? It it working for you? Are you rebelling against it? Share your thoughts (and your transmogs!). Of Dice and Dragons is an occasional feature about games and gaming. Great transmog on your warlock, btw. Just a look at her and I can totally see her as a warlock with a scientific approach to demonology. And considering that, the floating skull is not really a good fit. 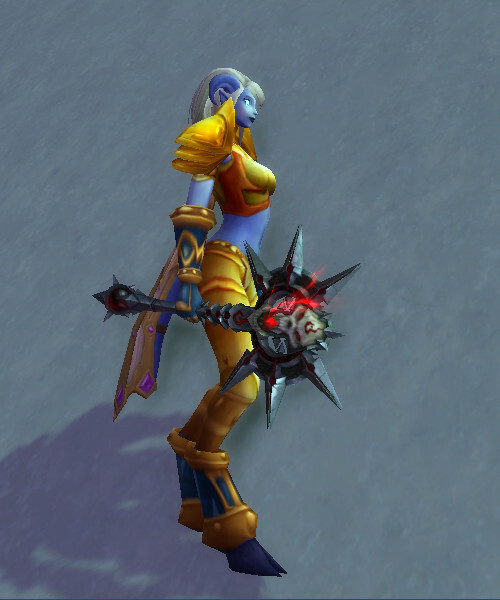 Maybe the artifact appearance that makes it look like a draenei/eredar head? Know which one Im referring to? Oh, yeah, I definitely know what you mean about goblins and their guns–sleek and polished is not their bag! I’ve looked at some of the alternative appearances for the warlock artifact. I think I know the ones you mean. I hadn’t thought of those as possibilities, but I can see how they could maybe work. Interesting idea!